A golden, flaky Gluten-Free Pie Crust that is simple to make and perfect for making gluten-free pies. 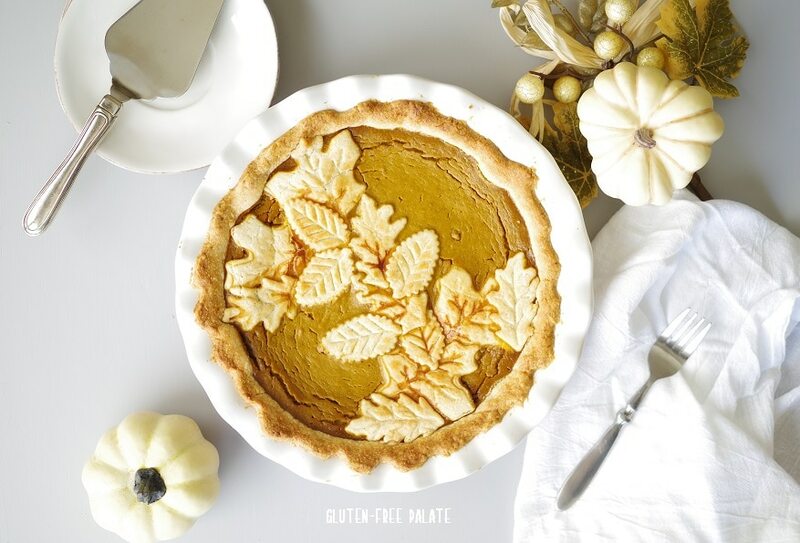 You are going to love working with this gluten-free pie crust recipe. Dairy-free and vegan option included. Over the years I have shared some of my favorite gluten-free pie recipes. While many of them use the same gluten-free pie crust, I’ve never shared a post that highlights the recipe by itself. Some of my readers have been asking for a post that gives only a gluten-free pie crust recipe with tips and tricks. Many people are intimidated by gf pie crust recipes. It does take a bit of extra time versus purchasing a gluten-free pie crust at the store, but the fresh flaky crust at the end of it is worth it. It’s not hard, it doesn’t take a lot of ingredients – it only takes about 20 extra minutes. Making the gluten-free pie crust is simple, again, it just takes some time. Here are the steps. In a medium mixing bowl, combine flour, salt, and xanthan gum. With a pastry knife (or a knife and fork), cut butter (or shortening) into flour until the size of small peas. 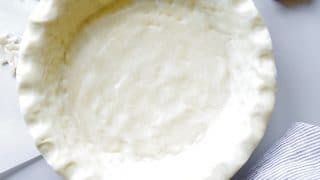 Divide dough in half and roll each ball of dough out on a gluten-free floured surface with a rolling pin until approximately 10-inches in diameter. Alternatively, roll dough between two pieces of wax paper. If you are baking the crust and then filling it with filling, preheat oven to 425°F (220°C). Bake for 15 – 18 minutes or until cooked through. 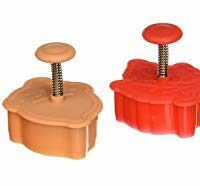 For other recipes where you bake the pie with the filling in it, follow the recipe baking instructions. 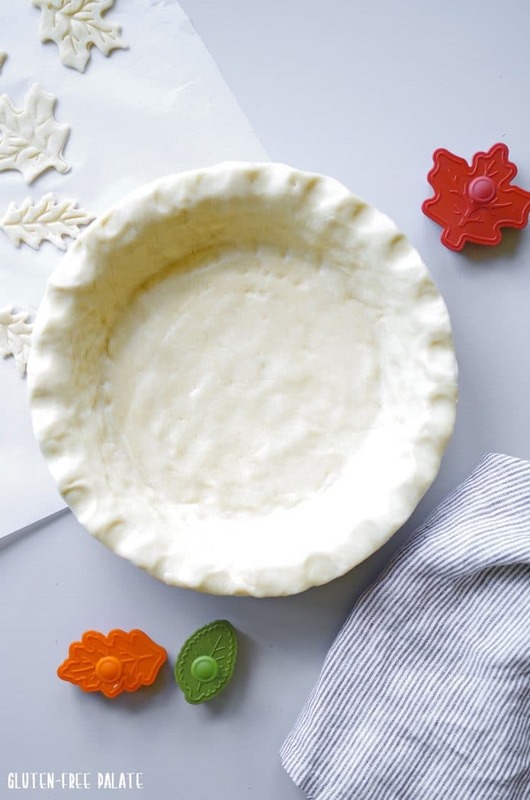 This gluten-free pie crust recipe makes two, 10-inch gluten-free pie crusts. There is a dairy-free and vegan option if you need a gluten-free vegan pie crust. 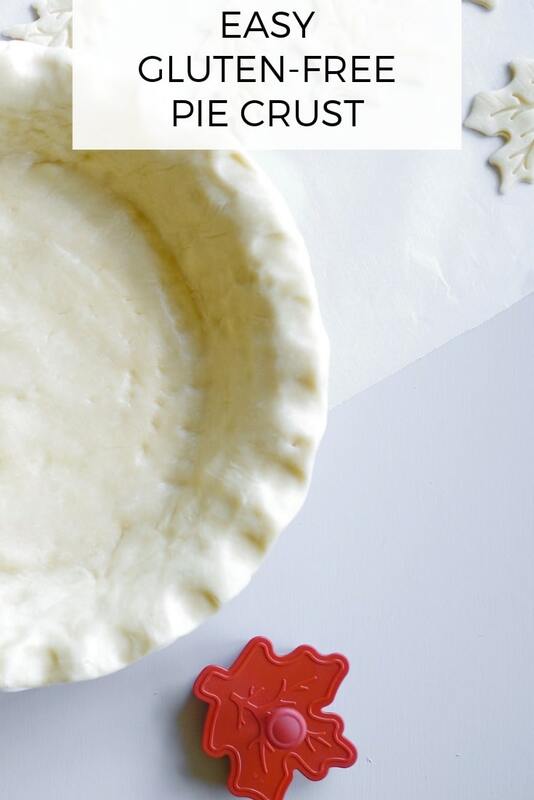 If you don’t need two pie crusts, either cut the recipe in half or freeze the second pie crust. Read the recipe steps and make sure you have all ingredients on hand before you begin. Make sure all ingredients are cold before you begin. If you use a flour blend with xanthan gum, omit it from the recipe. 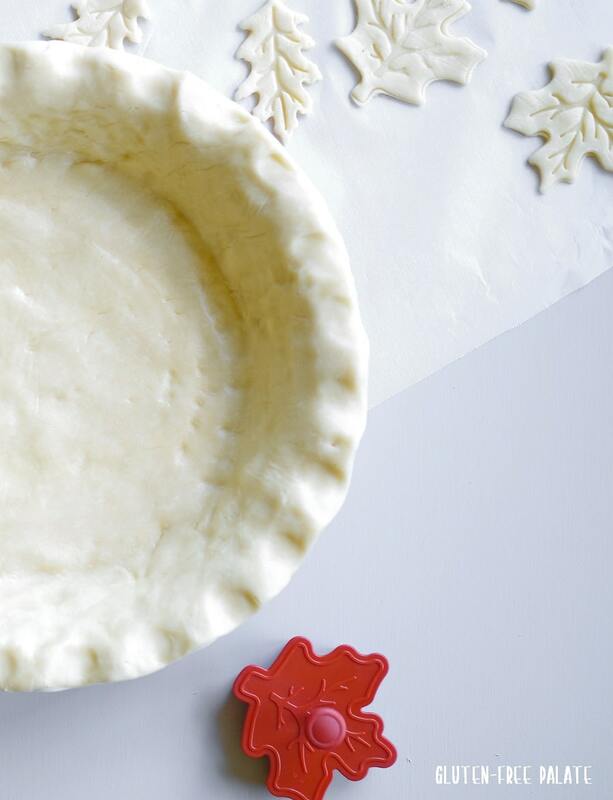 Don’t overwork the crust dough, it will toughen and cause cracks when you transfer it to the pie pan. If the pie crust dough is too soft, chill for 30 minutes before rolling it out. 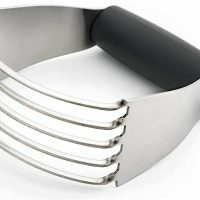 For a decorative top – cut out lattice strips and weave over the top of the pie, or use cookie cutters for fun shapes. Just another tip about gluten-free pies in general. I always bake my gluten-free pies on a baking sheet in case the filling bubbles out. It helps prevent a mess in the oven. I cut this gluten-free pie crust recipe in half to make this stunning gluten-free pumpkin pie (pictured above). I had some extra gluten-free pie crust dough leftover, so I used leaf cutouts to decorate the top. This gluten-free pie crust is versatile and works with savory and sweet gluten-free pies. 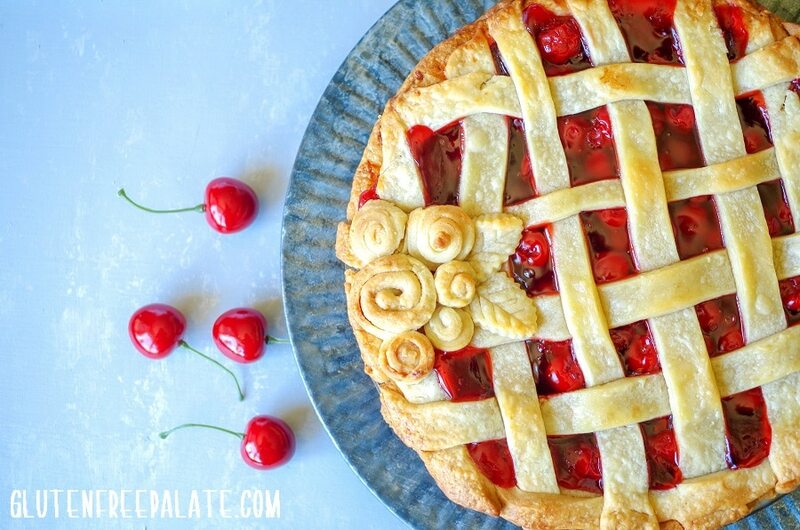 If you are interested in more of a lattice look, I also used this gluten-free pie crust in my gluten-free cherry pie. I placed one pie crust on the bottom, added filling to the center, then cut the second gluten-free vegan pie crust into strips. Weaving them together was easy. Do you have to egg wash gluten-free pie crust? Some people use an egg wash on their gluten-free pie crust to give it a glossy coating or to help it brown. I don’t. When I bake gluten-free pies I start with foil over the crust for about half the baking time, then I remove the foil and let the gluten-free pie crust brown while it finishes baking. The crust will cook and start to brown under the foil, but it’s this process of keeping it covered upfront that helps keep it from darkening too much while the filling bakes up. Can I use shortening instead of butter in pie crust? Yes. 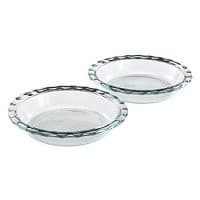 I use palm shortening to keep my gluten-free pie crusts dairy-free and vegan. 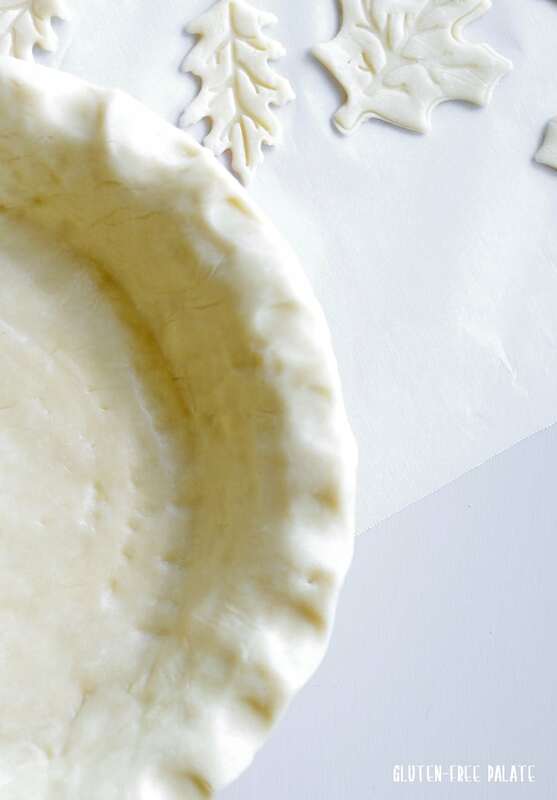 You can use butter or regular shortening in this gluten-free pie crust recipe. I haven’t personally tried dairy-free butter in this recipe. This gluten-free pie crust recipe is the go-to recipe for all things pie in our house. I like to use Bob’s Red Mill 1-to-1 gluten-free flour blend when making pies, but you can also use a similar blend, or my gluten-free flour blend. Looking for more gluten-free pie recipes? You might like my Gluten-Free Chicken Pot Pie, or my Grain-Free Pecan Pie. If you are looking for more dessert pies you should check out this Dairy-Free Banana Cream Pie from Meaningful Eats. What the Fork Food Blog has a scrumptious recipe for Gluten Free Fudge Pecan Pie. A golden, flaky Gluten-Free Pie Crust that is simple to make and perfect for making gluten-free pies. If you are baking the crust and then filling it with filling, preheat oven to 425°F (220°C). Bake for 15 - 18 minutes or until cooked through.